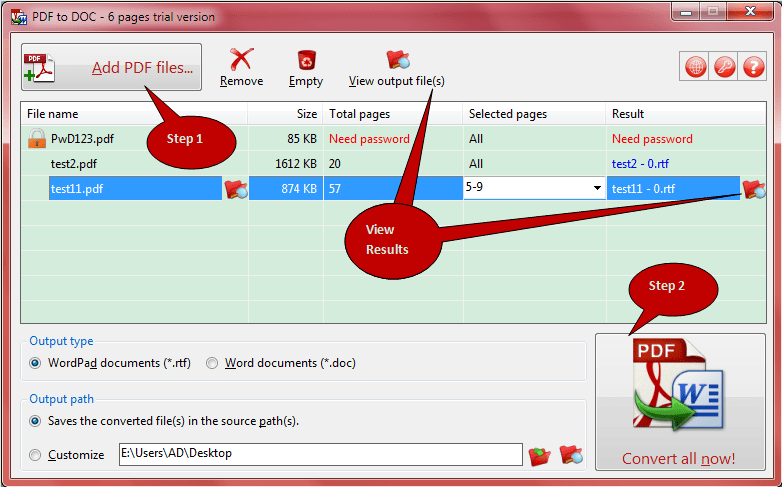 Click <Convert All Now!> button to convert all listed PDF files to Word (*.doc) or WordPad (*.rtf) documents. Just run the downloaded setup file (pdf-to-doc.exe). Run 'Uninstall PDF to DOC' on the related Start Menu folder or open 'Add/Remove Programs' in Control Panel and double-click 'PDF to DOC #.#' in the list box. Note: if registered successfully, you can find your license information on the "About PDF to DOC" interface. Lost the license key? Don't worry. It's easy to retrieve your license key of PDF to DOC. Just click Lost license key? menu item under <License> button . -v Shows PTD's CLI information, version number, copyright and license information. -o:output path of converted file. Optional. Specifies the output path for the converted file. E2: Invalid output format (-f:), it must be RTF or DOC. E5: Invalid page range (-p:), the correct format is n-m, e.g. 1-29. It starts from 1, and ends at the total pages. E6: Internal error occurred, this PDF file cannot be converted. Optional. Specifies the format of output file. 2) change current path to PDF to DOC's program folder by using "cd" command (may need to change current drive first). Right-click PDF to DOC's shortcut icon and click "Properties" menu item, you will find the path in [Start in] field. 3) Now you can simply type "ptd -i:..." to use PTD' CLI. First, need to install PTD on your licensed PCs, and then simply use the Shell function (or other similar functions) to do it. In this case, do NOT need to install PTD on the PCs that you want to deploy to. And you should purchase PDF to DOC Redistributable CLI, click here to know more details. b. Please use space to separate each arguments, if the full path of PTD.exe or any argument's value has the spaces, you must use "" to delimit it (include argument name). E.g. "-i:F:\test folder\test 1.pdf"
d. If you passed twice or more for a same argument, PTD only uses the last passed value. E.g. PTD -i:F:\test.pdf -i:F:\test1.pdf, PTD will convert F:\test1.pdf. "E:\Program Files\PDF Helper\PDF to DOC\PTD" -?